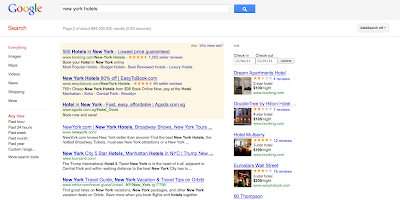 I just noticed new Ads format for hotel keyword (i.e., "New York Hotels"). The display looks like hotel listing thumbnail on online travel websites that most users are familiar with. Interesting to see how this impact to CTR. Of course, it will kill meta-travel search like Kayak again! Let share what do you think about this?